You are here: HomenextTopicsnextViews of the city: images & opinionsnextMystery photos of Brighton and HovenextPolish Sailors help with the Harvest? Just prior to the outbreak of WWII the Polish authorities decided to move most of its naval vessels to British ports. This successful operation proved to be a wise decision; during the German invasion 70% of the Polish Air Force were destroyed. 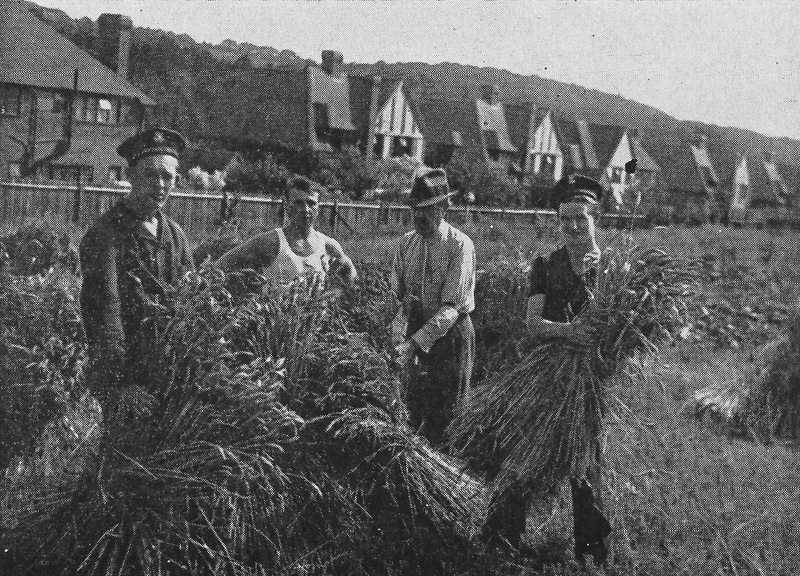 In the photo Polish sailors can be seen somewhere in Brighton helping with the harvest. I have no idea of the location, perhaps someone can help? The plan to move the Polish naval vessels was called the Peking Plan, I have no idea why it was called that either? This looks very much like the Patcham area. As for using the name “Peking Plan” I can only assume it was just the code used to confuse the enemy. Poland and GB understood that Germany was looking for a reason to invade during that period so the plan was a success as the 3 vessels in the plan made it to the UK before the outbreak of war and fought alongside the Royal Navy for the rest of the war. Patcham seems right; this may be at the rear of the Brangwyn estate on the west side of London Rd. These were built in 1936 with no more development until the 1950s. It is not clear, but the trees in the background could be the big belt surrounding Withdean Park across the London Rd. What might be houses in the top left hand skyline would then be somewhere up at the Surrenden Rd/Braybon Ave area? I didn’t know, but now looking at Google I think you are both correct. I think it’s looking north up the London Road, the sailors are harvesting on the thin strip of land that is still in front of the Brangwyn Estate. I think the hill in the background must be Westdean and towards Windmill Drive. I agree with Bob and Geoff on this. I think the houses (and their back gardens) in the photo include 19 to 24 Brangwyn Way, which face the A23, Patcham by-pass. No 24 is the house on the extreme left of the photo. I cannot think of any similar row of mock tudor properties which fits in with the houses in the photo. I think the photographer was looking south-east here Peter, at the rear gardens and the backs of the houses in Brangwyn Way. The back of No 24 (with its shallow upper windows and pipework) looks much the same today. Got it Alan, I think you are correct! Well done, gentlemen. I thought it might be the Brangwyn Estate because of the mock tudor houses, but couldn’t figure out the angle. I’d love to get hold of a copy of that book, Peter. It looks fascinating. Janet, there is a copy in the public access area of The Keep.